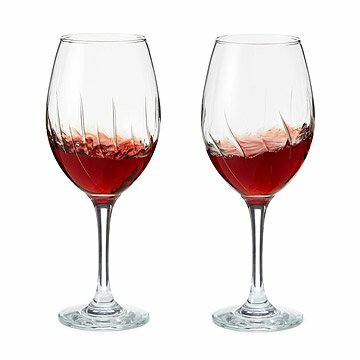 With a gentle swirl, the whirling ridges winding around these goblets will aerate your wine. The elegant, whirling design of these goblets won't just make your wine look better—they can actually make it taste better and help you feel better as you enjoy it. That's because those sinuous lines are actually ridges on the interior of the glass that aerate the wine right in your hands. There's no need to leave your bottle out to breathe before you enjoy it. Simply swirl the glass in a counter-clockwise motion, and the liquid brushes up against the ridged surface, mixing in oxygen and releasing carbon dioxide. This unlocks the aroma of red or white wine, allowing you to enjoy its fullest flavor. An astounding additional benefit of this process is that it reduces the amount of alcohol that enters your bloodstream, allowing you to enjoy more of your favorite vintage. Carbon dioxide that naturally occurs in wine can accelerate alcohol absorption, but aeration reduces the level of CO2. Independent testers have found that using the Aerating Wine Glass can reduce alcohol absorption by up to 30%! (The exact reduction will vary person to person.) Cheers to that! Made in Italy. Slightly larger than expected but they need to be large in order to swirl the wine. We could definitely notice a great difference in the taste of our wine! We use these glasses specifically for red wines that we think need aerating. The glasses are thick glass and not elegant but great for casual use. The wine seems to taste good from the glasses. These are the perfect wine glasses to use everyday, or for a more formal occasion. This is a great wine glass. You can serve a generous amount and have fun swirling it to aerate. It has a classy look and I think makes the wine taste better! I would buy again but this time for myself! More fun than the Waterford! Large wine glass, great for reds or whites... Very durable yet elegant, love love! I bought this as a mother's day gift and my mom loves them! She says they really do change the taste of the wine for the better, and is glad to have them! This product is great, I would recommend highly. Great about it, less trip to refill. One has to get used to the look of the size.